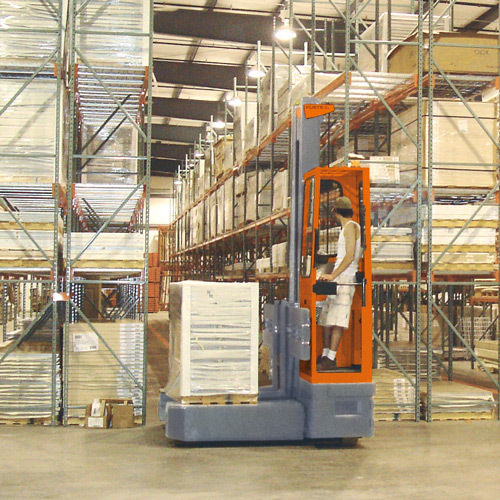 We offer electric multidirectional sideloaders with load capacities from 3,000 to 110,000 lbs. 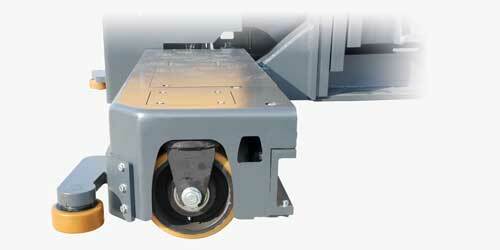 These all-purpose industrial trucks can be used for the handling of long and bulky loads, i.e. skids of sheet, bar stock and shapes, plywood and engineered lumber, dies, cable drums, rolls, oversized pallets all in narrow aisle rack systems or free range in indoor and outdoor areas. 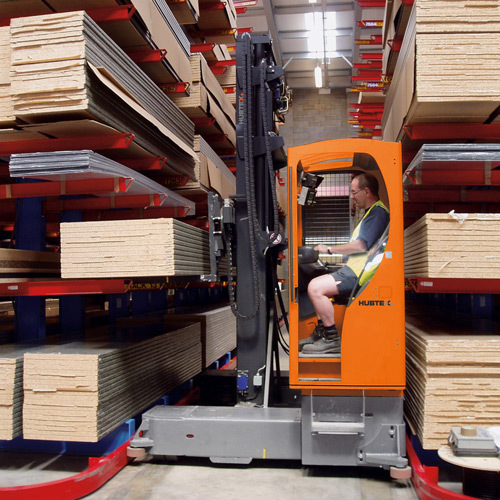 HUBTEX electric sideloaders can be tailor made to meet the individual requirements of end users. Multidirectional sideloaders with electric drive are suitable for the versatile handling of long, heavy or oversized loads. The trucks are based on a modular system and can be tailor-made to meet the individual requirements for the end user. For different requirements, HUBTEX offers Vulkollan tires (PU) for even industrial floors and, optionally, soft elastic tires (EL) for poor ground conditions or for outdoor use to preserve the vehicle components and driver comfort. 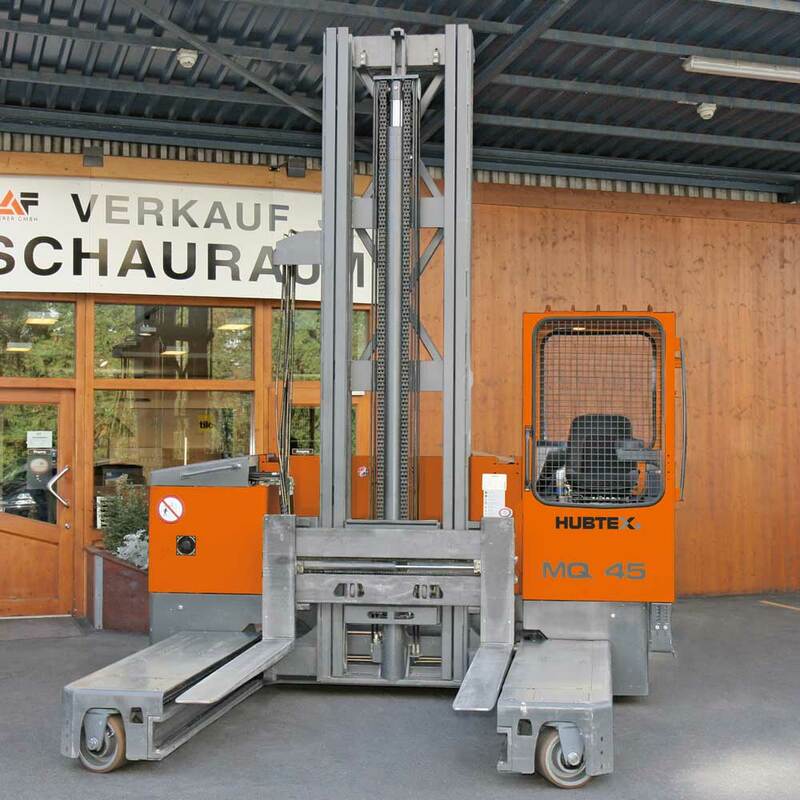 The most cost-effective mast version is manufactured with standard free lift for all HUBTEX sideloaders. When the loads rest on the load bed, the closed height of the mast is also the maximum transport height. The closed height of the mast is also the maximum transport height in the free lift range. This is, above all, advantageous to the handling of loads in the case of passages and limited hall heights. Lowest overall height, in the retracted condition, for great lift heights. HUBTEX offers forks for every application. As an essential vehicle component, they have to meet particularly high requirements. 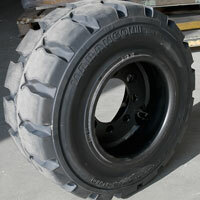 Due to the use of high-quality products, least possible wear and high load capacities are ensured. To compensate for uneven floor or ground, lifting forks are available for all load capacities, also in combination with telescopic forks. 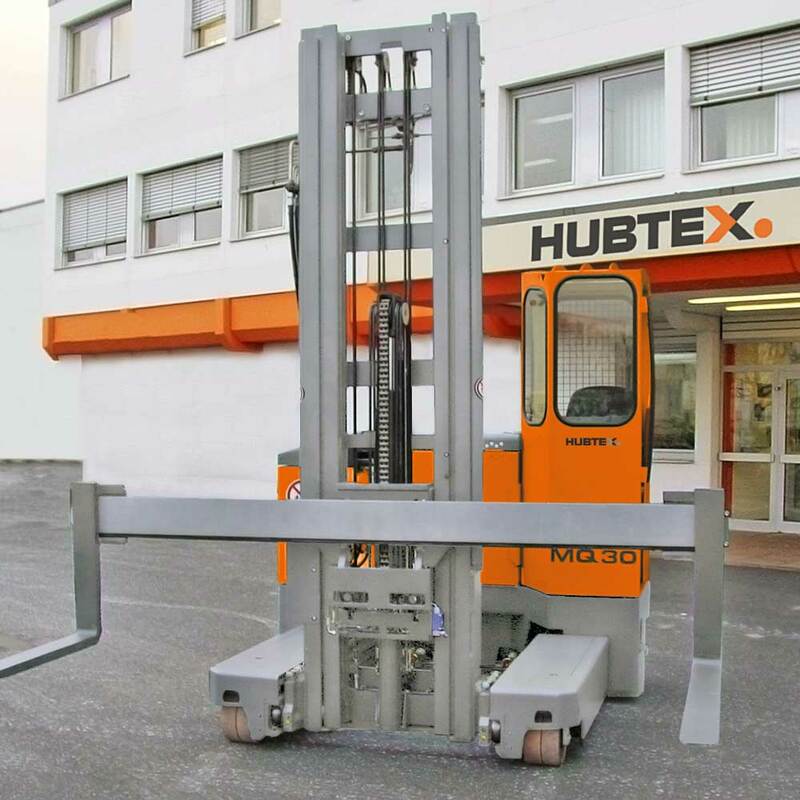 For the loading and unloading of lorries from one side or for the double-deep storage of goods in rack systems, the HUBTEX sideloaders can be equipped with telescopic forks (manual or hydraulic) which are available in all lengths and load capacities. 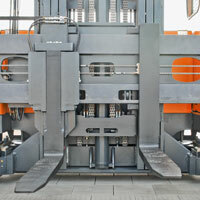 Knife type forks are available at extra cost for picking up loads in extremely narrow spaces. 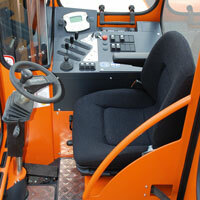 The spacious and ergonomically designed driver workstation offers plenty of elbow room and optimal all-round visibility The vibration damped cabin as well as the full suspension, multiply adjustable comfort seat provide for smooth working without getting tired and preserve the driver’s health. 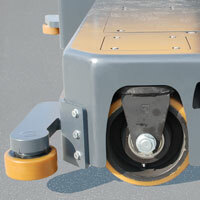 Guide rollers (4″ safety distance on each side) in single version up to 10,000 lbs and in twin version from 10,000 lbs. This mechanical guidance is robust and has been proven in practice. The wire guidance (6″ safety distance on each side) is a reliable and safe system with the advantage that the guide wire moves your HUBTEX sideloader into the lane before the latter enters the rack system. In this way, damage to the sideloader or the rack system is ruled out. 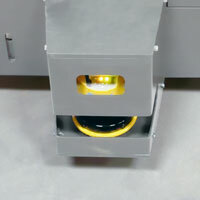 The optical guidance system (6″ safety distance on each side) is based on the wire guidance technology and is used when the required iron-free space is not available in the floor for the guide wire. The rack aisle is permanently monitored by means of two laser scanners. 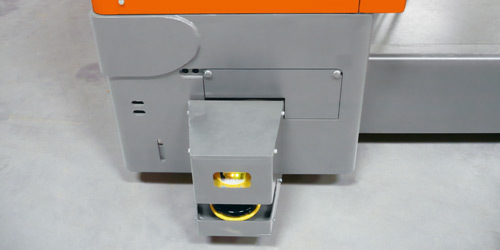 If the laser scanners detect persons or obstacles within their protection field in the aisle, your HUBTEX sideloader will be automatically brought to a standstill, independently of the driver’s/operator’s actuation. 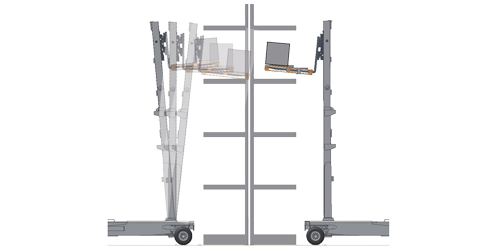 For the activation/­deactivation, the HUBTEX sideloader is equipped with two aisle ­recognition systems. 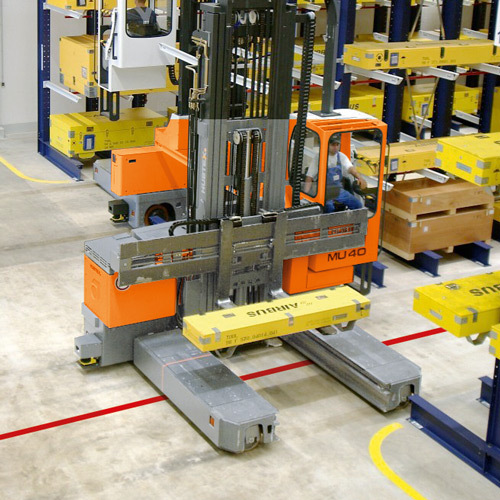 The SGA is an automatically operating safety device and is used for the protection of persons during the operation of industrial trucks in narrow aisles. 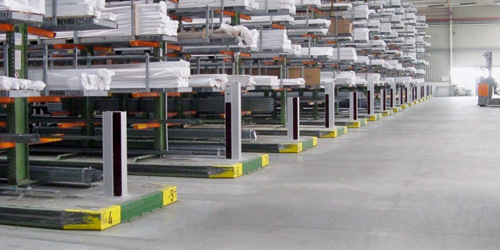 It is officially approved as risk minimizing measure for the operation of a narrow aisle warehouse. If desired, further functions can be performed by the SGA: Monitoring of escape doors/escape routes. Enables precise, predictable maneuverability in tight areas. This exclusive HUBTEX system provides a much greater steering angle and overall maneuverability than any competitor. The two-piece articulated chassis frame, which has been tried and tested over decades ensures permanent floor contact of all wheels to immediately compensate for uneven floor or ground. This exclusive design makes the truck extremely stable. 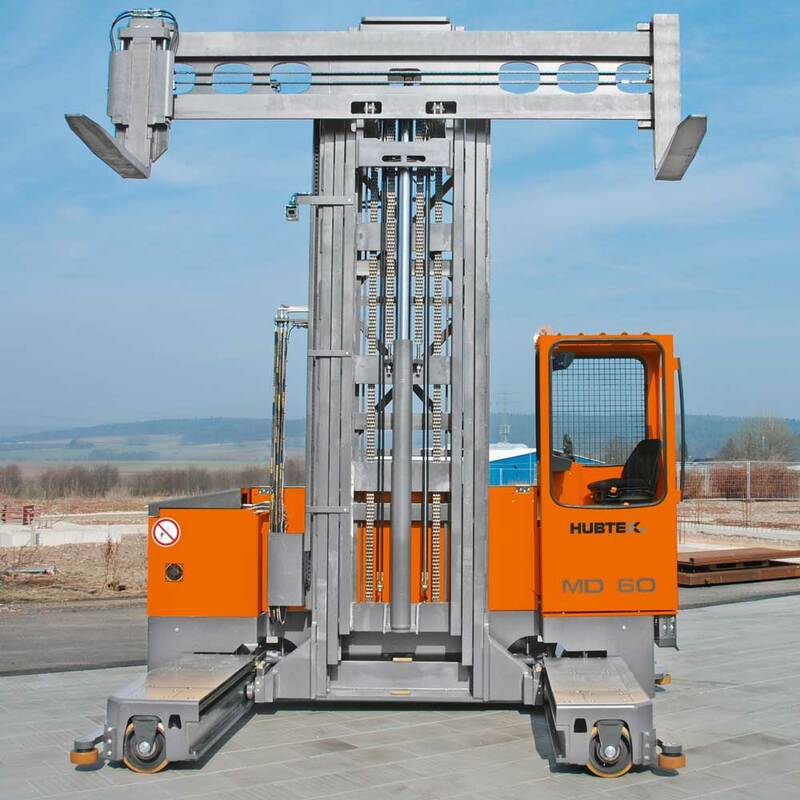 By tilting the carriage rather than the mast, HUBTEX Sideloaders maintain more stability by allowing higher derated capacities, therefore increasing safety at all lift heights. 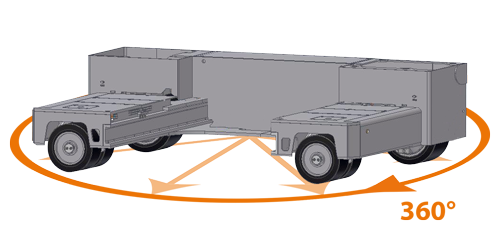 All wheels on HUBTEX electric multidirectional sideloaders are protected within the truck frame. This prevents downtime and helps eliminate unnecessary damage to important drive components. 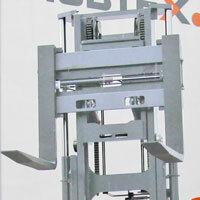 All HUBTEX electric multidirectional sideloaders are configured for CAN-BUS communication. All units are equipped with very low maintenance AC drive and hydraulic pump units. 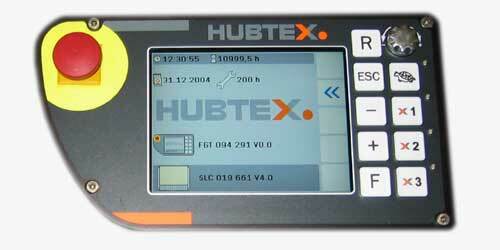 All HUBTEX electric sideloaders are self-diagnostic. A state of the art HIT2 terminal provides the driver with key operational and maintenance information at a single glance to a full color screen. Using the new steering system HX it is possible to change from lengthwise into crosswise drive without stopover. 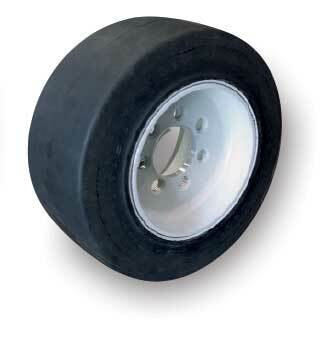 This reduces the time needed for switching the wheels and offers excellent maneuverability.